Have I told you already that I’m very fond of my blender? It makes it easy to eat healthy with fruit, milk, protein, immune-boosting yogurt, and other nutritious ingredients. Sometimes I’m simply not in the mood to eat a bun or a porridge in the morning. Especially in summer I prefer a fresh and fruity breakfast. The easier and faster it is to make the better it is in my opinion, especially after a run in the morning. The Super Healthy Red Beauty Smoothie is a perfect start to the day, because it is easy fast to make, but it is quite a challenge for me, because I work with an ingredient I’m not really keen on. That is why I have to be really brave this time. Do you know what I mean? Certain kinds of food do not attract our attention, because let’s say they are kind of special as far as their flavor is concerned. For me the beetroot is really special, but nevertheless I want to work with it today. 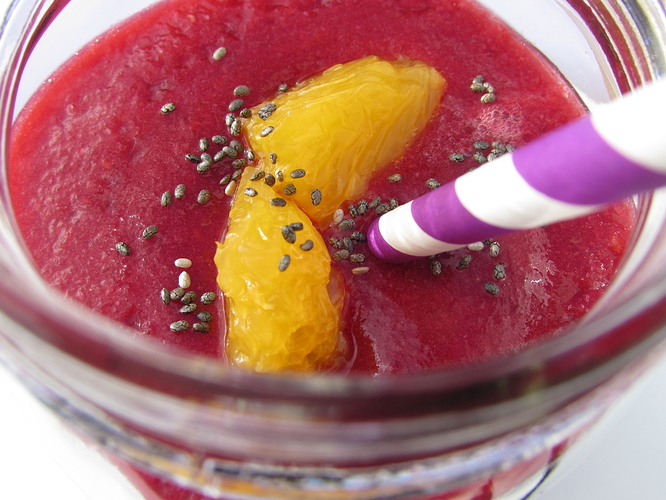 Now it is up to you to check out, if you like a smoothie with beetroot or not. Are you brave enough? In order to encourage you it might be helpful to know that beetroot is known as a source of iron, folic acid, potassium, fibre, magnesium, vitamins such as vitamin C, and vitamin B. 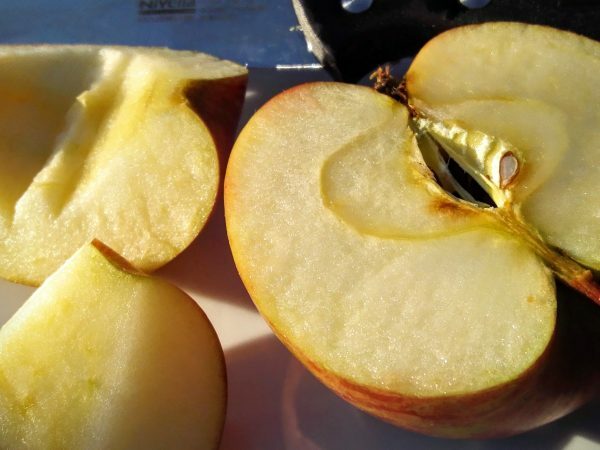 Further more amongst other benefits for our health it is heart protecting, blood-purifying, and liver cleaning. Do you need more reasons to be brave enough check it out? 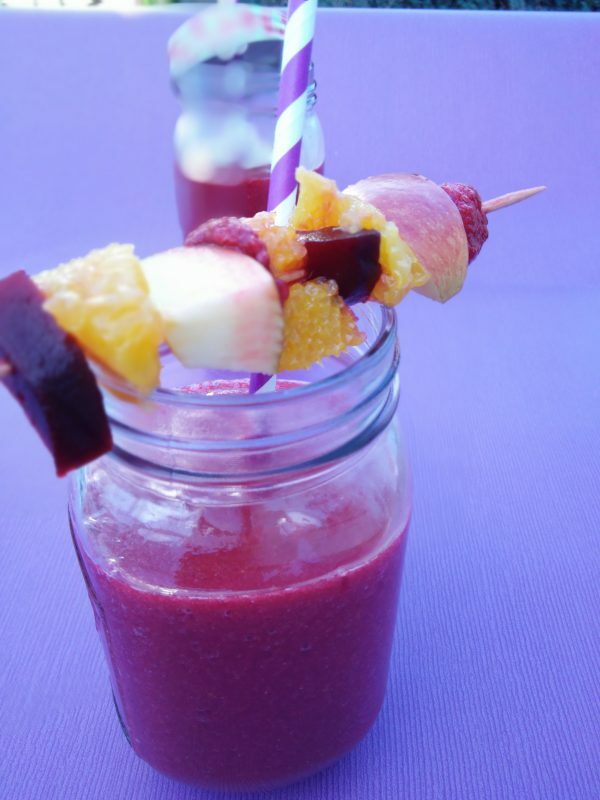 Are you in for my Super Healthy Red Beauty Smoothie? This recipe serves 3 to 4 persons. This recipe is also available in German just click here. 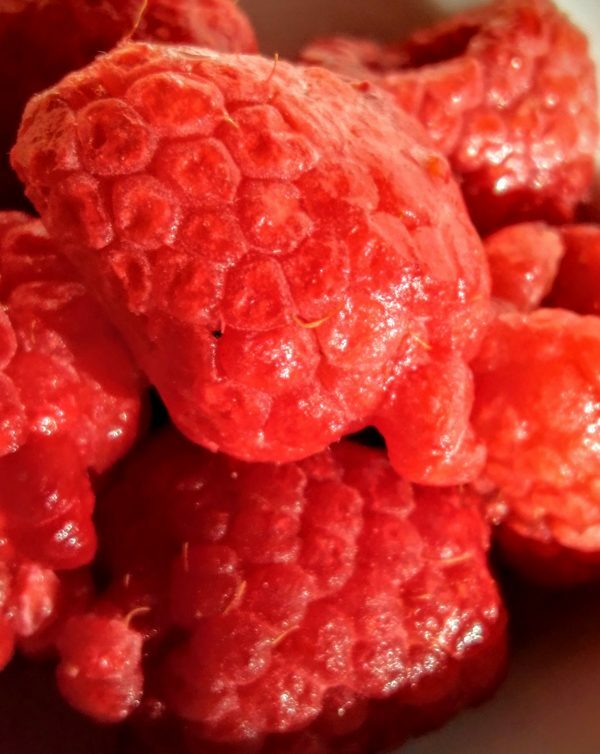 Take the raspberries out of the freezer, put them into your blender, and all allow them to defrost slightly. Wash and peel the beetroot. Then cut the beetroot into slices, and add the slices to the raspberries. It is useful to wear single-use gloves to do that. Halve the oranges and squeeze the juice from their halves and add it to the other ingredients in the blender. 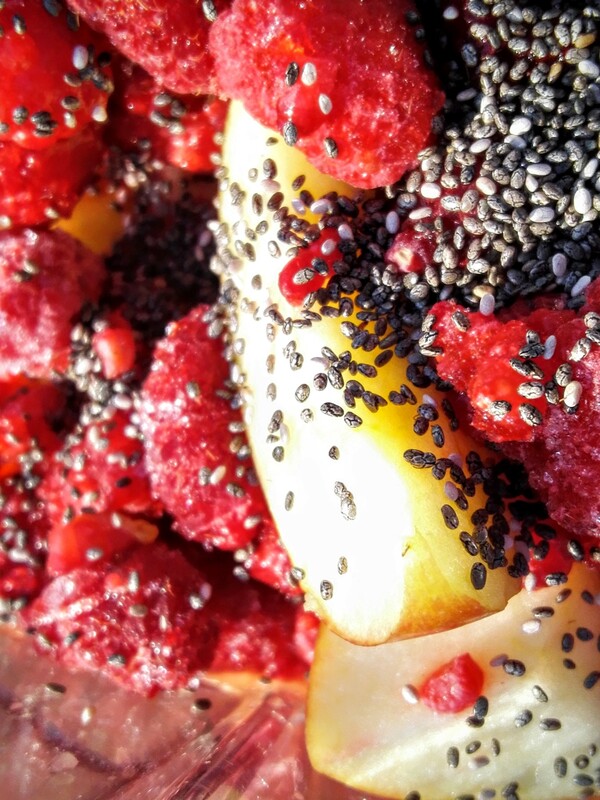 Add the chia seeds and the honey to the other ingredients. Blend the ingredients until they are smooth and pour your Red Beauty into glasses. To taste embellish your Red Beauty with a fruits skewer. Enjoy your super healthy start to the day! The Far Breton with Apricots and Cranberries is a French dessert that can be served as complete lunch as well as a warm dessert or a cold cake with coffee. You can serve it "Comme vous voulez".